Ow! This bag is so yellow my eyes hurt. I guess you're not supposed to look directly at it lest you do damage to your retinas. 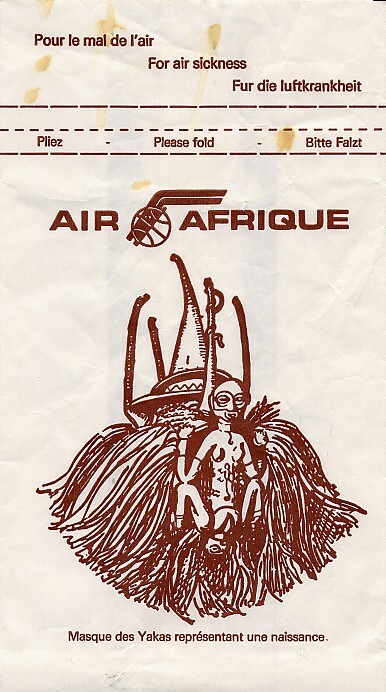 This Geneva based airline flies from Europe to Africa. 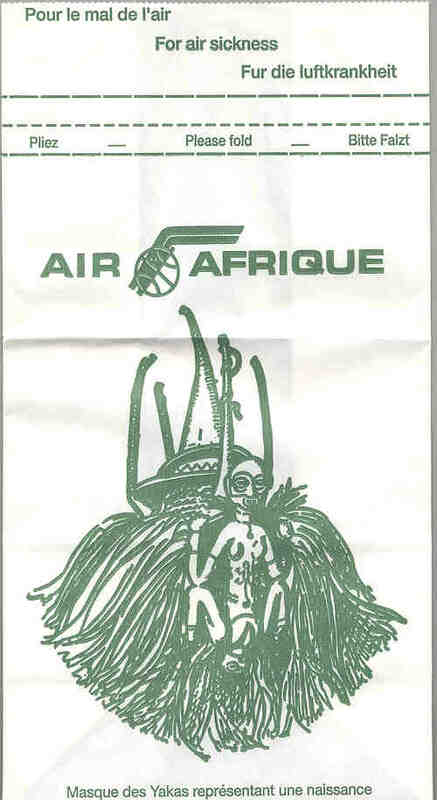 This Geneva based airline flies from Europe to Africa. 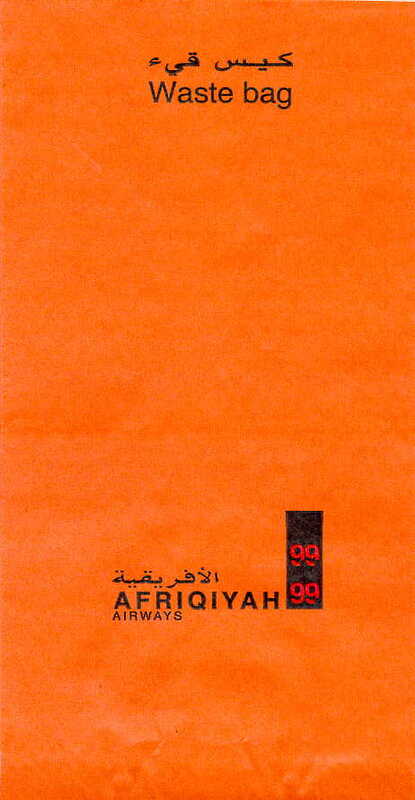 Identical to other Afriqiyah bag except it's orange, not yellow. Used extensively as a generic. Same as other bags of its ilk, except there is no flat bottom. 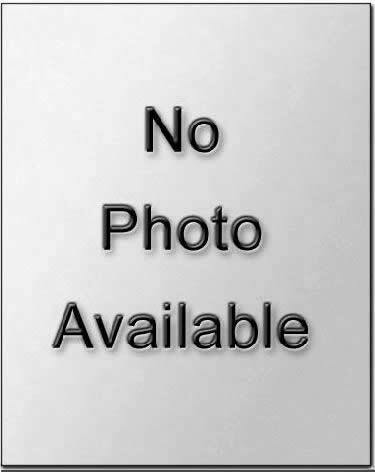 Used extensively as a generic. 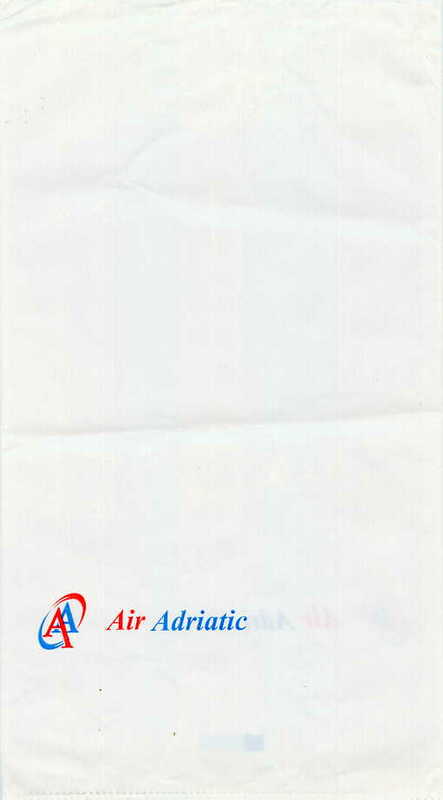 Republic and Bar Harbor Air Lines are examples of airlines that use/used this bag. 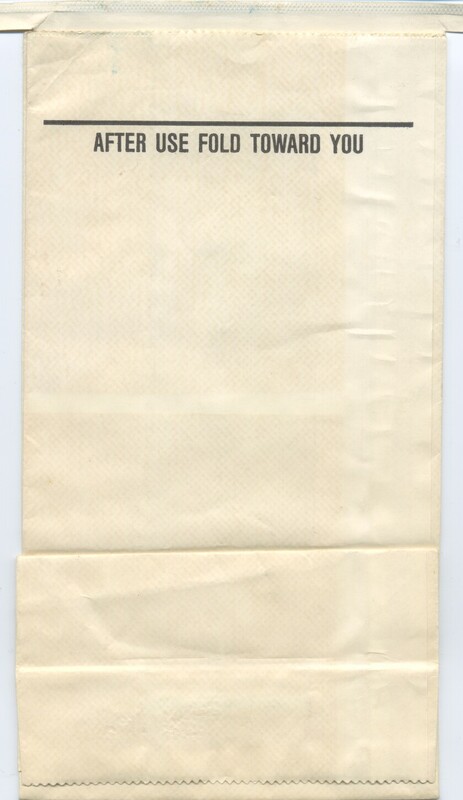 Same as other 'After Use Fold Toward You' except the useless horizontal line doesn't go all the way across the bag. Blue Eagle airlines show a bird that looks nothing at all like an eagle. 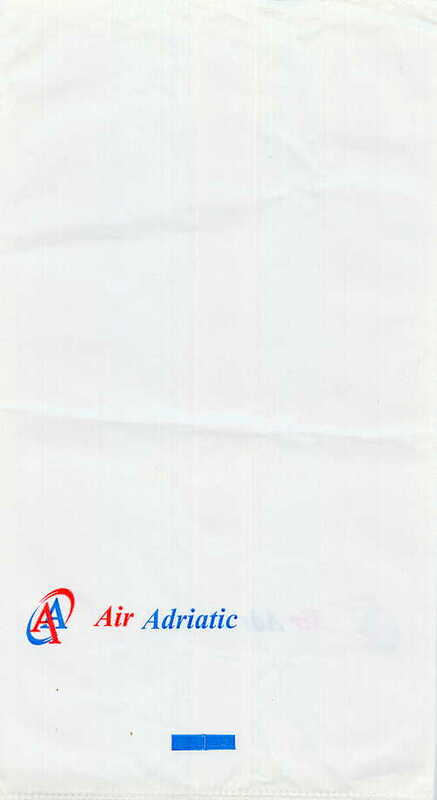 English Charter Airline owned by travel agents. Oooh. Went to multi-color printing! Check out the aircraft that carries this bag. 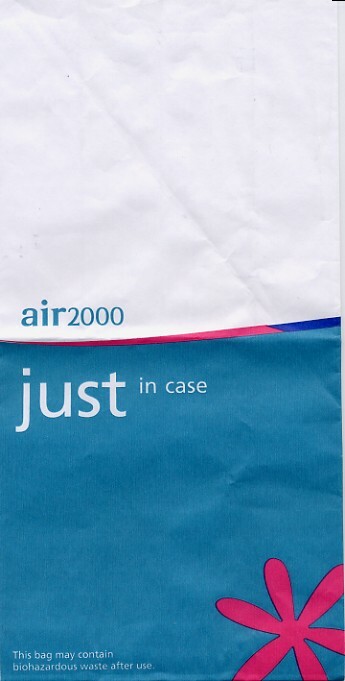 In a retro move, Air2000 adds a 'Flower Power' flower a la JAT. Nice teal bag that just might contain bio-hazardous waste after use. 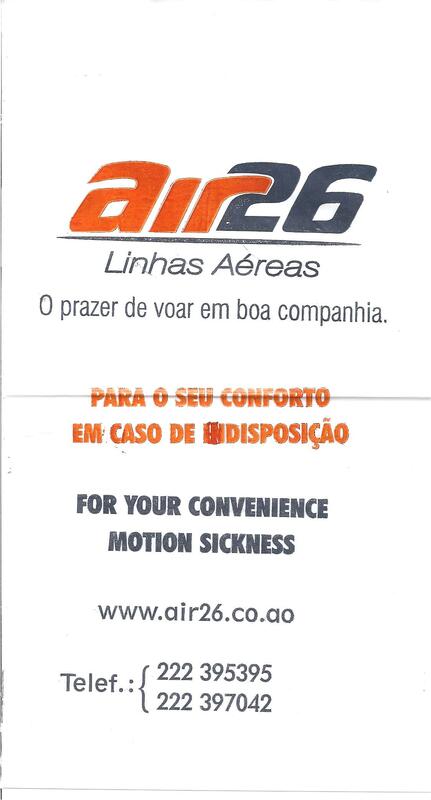 An excellent bag from Angola, I'm not sure what the significance of 26 is though. Maybe it's the number of passengers they can carry at once? 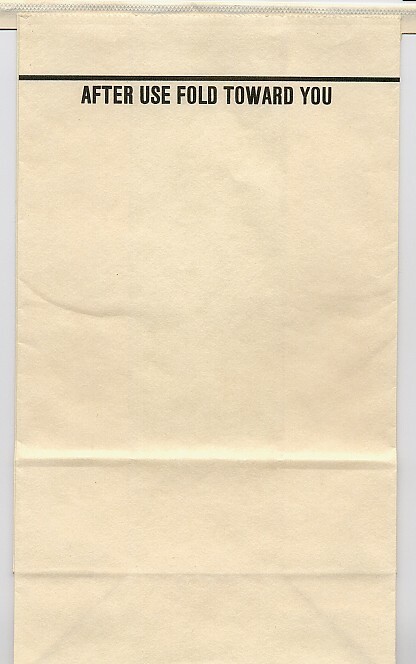 A flimsy bag that sports a pyramid/bowling motif missing the head pin. Pictoral instructions are back are remarkably unclear. A flimsy bag that sports possibly the most useless instructions on any product ever designed. As far as I can tell, you take a cotton ball, put it into the bag, and you're done. I typically hate the SATA / Air Acores line of bags, but this is the best of the lot since it's done on tasteful dark blue. 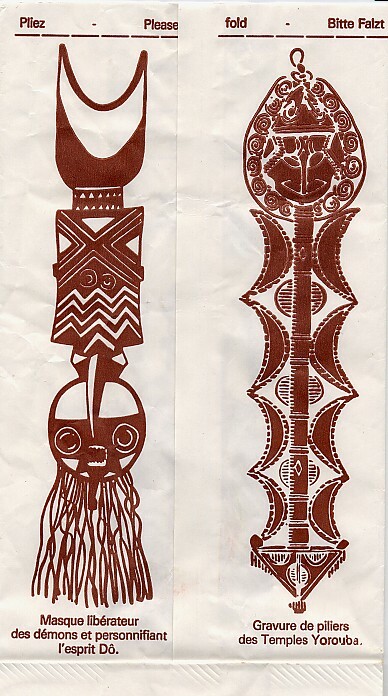 It's still flimsy of course, but at least it's easy to differentiate from the others. 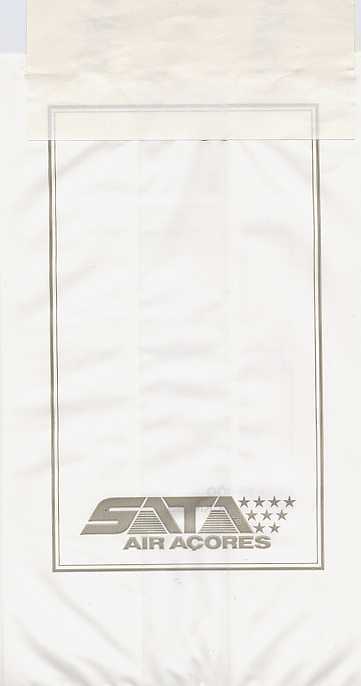 I don't love the SATA / Air Acores line of bags because there is no identifying text other than the logo. 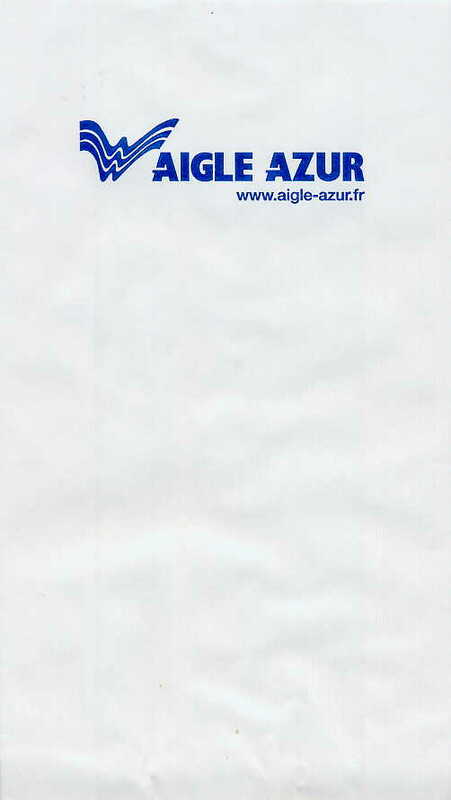 Nice double-A logo with italic font. First, their logo looks like a mutated cross between the NBA and NHL logos. 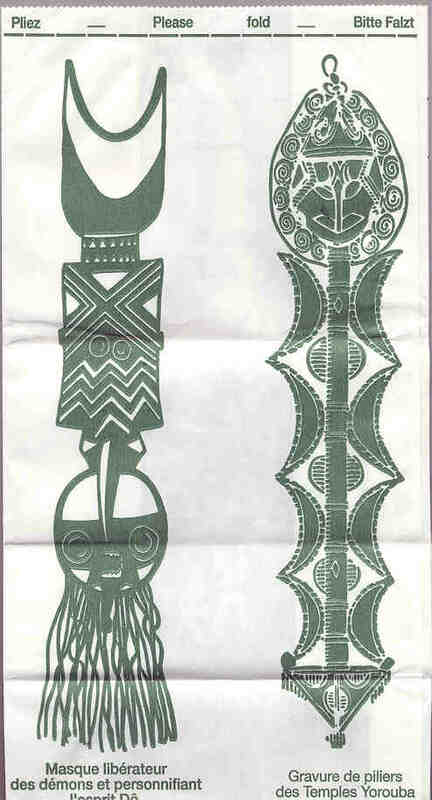 And the Tribal Birth Mask on the front (or as numismatic nerds would say, obverse) sets up the expectation that your plane will be greeted by half naked dancing natives. This bag should set race relations back about 200 years. 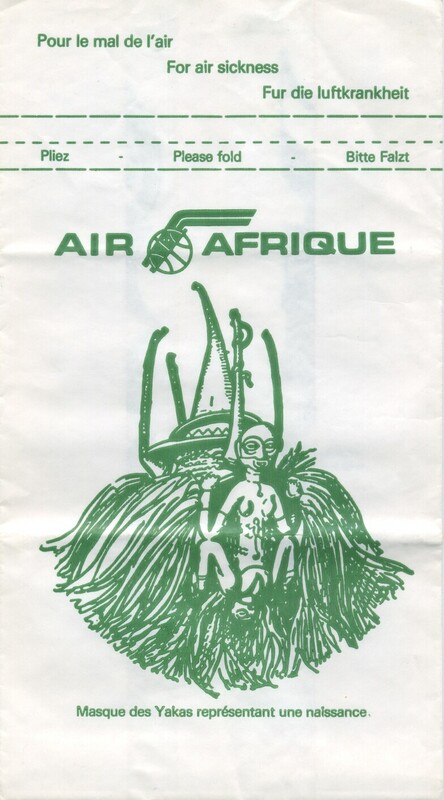 Identical to other Air Afrique Green bag except there is no base to stand on, plus the dashes by the folding instructios are extremely narrow. 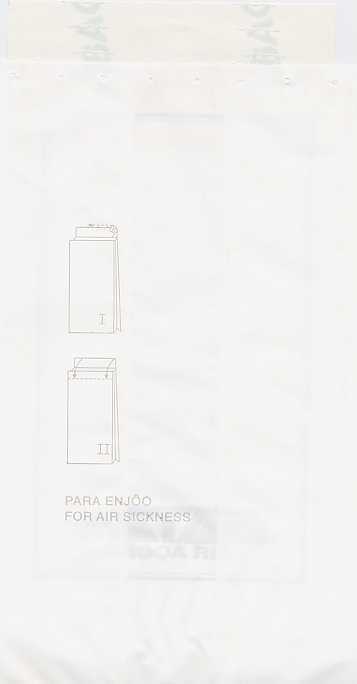 Identical to other Air Afrique Green bag except there is a base to stand on, plus the dashes by the folding instructios are extremely wide. 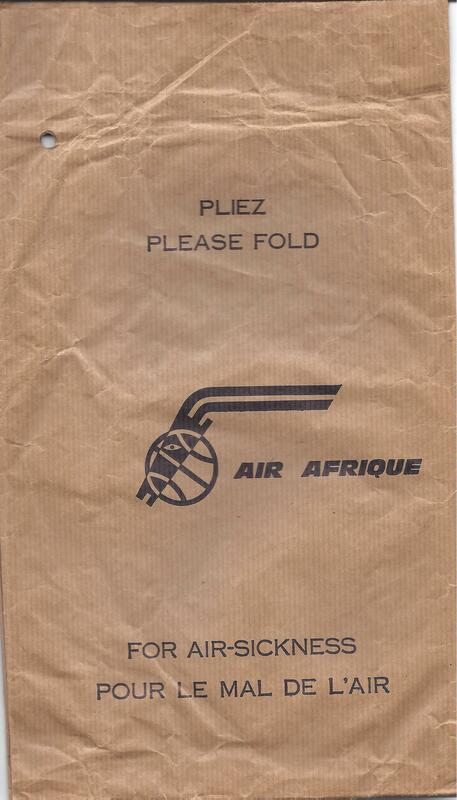 Identical to other Air Afrique bag except this one is brown instead of green. The inner fold (not pictured) also has the amazingly ridiculous concatenation "Franpap", which I guess stands for France Paper. Maybe Switzerland has Swipap? Wow the age on this thing is palpable. 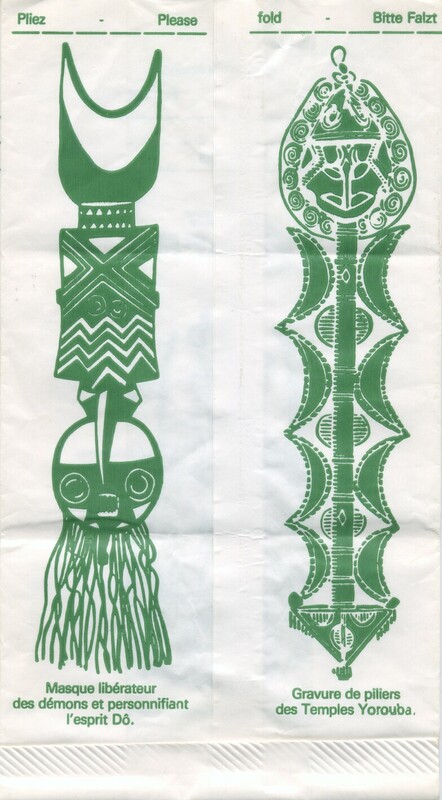 Probably 1970s but by its size (exceedingly colossal) it is more in line with the late 1960s.